Meal planning used to be a no brainer for me. Lately, changes to our schedules, weather, and general lack of inspiration have all been affecting my ability to plan. My usual MO is to check out what I've got pinned or in my "On-Deck" folder, then I think about what I've got on hand, or if a trip to the store is needed. Sometimes, I get my kick in the pants based on the "Food Holidays" calendar. A glance at today showed it is National Lasagna Day. I had this recipe pinned, and a quick check of the fridge showed I had all the ingredients on hand. I knew I'd swap shredded mozzarella for the swiss. I got sidetracked when I went to grab the chives, and ended up omitting them. I added some Italian seasoning to the sauce, and I think next time it could use a little garlic somewhere along the way. I doubled everything to get 6 rolls. About halfway through summer, and the guys have been getting bored with my usual hotdog/brat/kielbasa presentations. I've had some Jack Daniels in the fridge for a while, so I decided to give this recipe a try. My skewers have gone missing, so I knew that I'd be doing this as a skillet meal. I also planned to serve it over rice, so I wanted the veggies smaller than 1". Neither of them eat vegetables, and I don't do mushrooms. I had yellow, orange and red bell peppers, so I cut half of each into large dice, as well as half an onion. I upped the sugar slightly, to 4T, they like marinades on the sweeter side. I used Johnsonville Beef Brats, which are fully cooked, and it made this meal super fast to cook. Everything went into a ziptop bag and then the fridge for 1 hour. Thin Mint Zucchini Bread- thanks Carol! My husband doesn't like zucchini. He tells me so all the time. My son at one time also did not like zucchini. Did I let this stop me from trying a variety of amazing zucchini recipes? Nope. I just got sneaky with it. I peel the zucchini and shred it on the smaller hole side of the grater. A few years ago, my son caught me folding the zucchini into the batter of one of his favorite desserts, and he became my co-conspirator. I was fortunate enough to "meet" Carol through an online community. The woman is a wizard when it comes to zucchini bread flavors. We've loved every one we've tried. This recipe for Thin Mint Zucchini Bread is hers and I can't thank her enough for sharing it. It's blueberry time here in New Hampshire, one of my favorite times of the year. It's also one of the hottest times of the year! We've been on either side of 90 degrees for what seems like weeks now. Usually I don't run the oven in the summer, but I had a large pile of zucchini and this recipe printed and calling to me. I cranked the AC and got to work. I peeled my zucchini, just a family preference. My berries were huge and heavy, and sunk to the bottom despite being tossed with the flour. The recipe calls for a jelly roll pan, but I don't have one. I baked mine in a 13x9 pan for 55 minutes. I put on the glaze while it was still warm. I let them cool completely, then cut them into squares. I wrapped about half the batch individually in Glad Press and Seal. I popped them into a ziptop bag and then into the freezer. My cake mix and Jello addictions are well documented. I just can't resist a new fun flavor. As a result, my pantry runneth over and I've been trying to clear them out. I normally don't bake much when it's hot, but today I decided to crank the AC and churn out some goodies. I saved this recipe when I realized that I'd accumulated 4 strawberry cake mixes. The only change I made was to only dunk the tops, not the entire thing. My son was eyeing them before the glaze was even set. It makes a boatload, I got over 5 dozen using a Pampered Chef mini muffin pan and a 1 teaspoon cooke scoop. I'm going to try freezing half the batch and see how they defrost, if they last that long. Thank you to Jaren and Julie for sharing the recipe! While tidying up some of my kitchen equipment, I ran across my Pampered Chef Ice Cream Sandwich maker.Since it was National Ice Cream day, I thought I'd whip together a fast, fun treat.I polled the guys on whether they wanted cookies or brownies, and the winner was Chocolate Chip Cookies.This time I cheated and used bagged Betty Crocker mix, but you definitely could use your favorite from-scratch recipe.I mixed the cookies as directed, and portioned them out with a cookie scoop.This ensured nice, consistent rounds that fit perfectly in the ice cream sandwich maker. 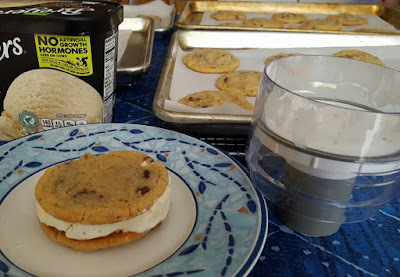 Once the cookies were cooled, I softened some vanilla ice cream in the microwave.I layered in the first cookie, about 1/4c of ice cream and then topped it with the second cookie.I flipped it over onto a cutting board, pressed the sandwich out and then quickly wrapped it in plastic wrap.I popped the finished sandwiches into the freezer to reharden the ice cream for about 20 minutes. Ah, summer. Trips to the farm and long days by the pool. Temps have been hovering around the 90s here in New England for a few days. I went searching for side dishes that could be prepared ahead and wouldn't heat up the house a ton. I found this recipe in Taste of Home's 2016 Grilling magazine. So many great recipes to try! I substituted rice wine vinegar for the white wine vinegar, it was what I had on hand. Dried parsley for the fresh. I found the vinaigrette a little tart, so I added about a teaspoon of honey. It went perfectly with some grilled chicken. Crunchy, bright and refreshing. 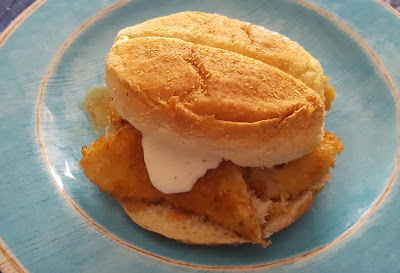 Thank you so much to Allison B for sharing the recipe! When life hands you melons, make salsa! Wait, that's not how it goes. :) This week, melons were handed to me as a challenge ingredient. None of us are huge fans here, except for watermelon. I buy it, cut it up in chunks. stick it in the fridge and we snack on it. I found this recipe on the Taste of Home site, and it sounded perfect for some holiday weekend snacking. Change #1- I don't do cilantro. I am in the "tastes like soap" camp. I used parsley instead. The other two changes were minor- yellow bell pepper for the red, and little baby cucumbers that I left the peels on. Easy, delicious and a wonderful change from traditional salsa, thank you so much to Carolyn B for sharing the recipe! My guys are away on a camping trip, and I'm practically giddy with the idea that I can eat whatever I want for the next few days. While both eat bacon, neither likes lettuce or tomato, and both would rather forego the bread. They can easily put away an entire pound of bacon by themselves, and still be looking for a snack afterwards. Since technically this is my "vacation", I decided I'd make meals easy. I used Oscar Mayer Fully cooked bacon, something I hadn't tried before. It was ok, but next time I'd opt for cooking it myself. I topped it with romaine lettuce, roma tomato, and that fantastic greek yogurt spread. I held back a little of the chopped basil for photography purposes, and sprinkled it on top (I've yet to master taking pics of white foods). Thank you to Alisa L for sharing this recipe! I am a fan of spicy foods, but my guys aren't. I love recipes that I can make that still give me my heat fix, but that they can eat also. I used thin sliced chicken breast, panko instead of regular breadcrumbs and sriracha. I held back the salt until after the chicken had been pan fried. The guys enjoyed theirs with just cheese, and I had mine without. Watch the butter mixture, it can burn quickly. Thanks to Tracy B for sharing the recipe!